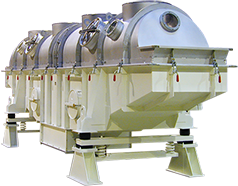 Carrier Vibrating fluid bed dryers and coolers are the perfect solution for processing fragile or temperature sensitive materials. The low amplitude vibration and reduced fluidizing velocity create a gentle bed, which causes less degradation than with static fluid beds or other mechanical dryers. Fluidized bed techniques are most effectively utilized in applications for drying, cooling, calcining or sterilizing. Dryers are built to compensate for thermal expansion with supply air temperatures up to 1200 deg F.